If you pull out an SPL meter and begin to take readings, you will quickly notice that louder sounds create higher readings, while softer sounds, or quiet environments produce lower readings. The quietest sounds that the human ear can hear are found just above what is known as the threshold of hearing. This is far below what most people can hear, but this threshold would be considered 0 dB. Very quiet sounds, such as a very soft whisper in an extremely quiet room would measure around 25 to 30 dB. The SPL of a normal conversation would be around 65 dB. Sounds with an SPL over 80 dB are considered loud, by comparison, and in some cases, are regulated by OSHA in commercial or industrial environments as to the amount of time we should be exposed to sounds with those volume levels. Concert SPL levels vary depending on the music type and/or genre, but a typical church worship service containing a full band would vary between 70 dB and up to 100 dB, depending on the church and worship style. Country music concerts will usually exceed 100 dB, and the typical hard rock concert can reach SPL levels of close to 120 dB, but typically around 110 dB, depending on your seat in the audience. These are just common averages, not my recommendations on a suggested SPL (that’s coming!). The human ear’s sensitivity to all the frequencies found in the music we hear is not flat, or equally balanced. In other words, our ears are much more sensitive to midrange frequencies between 2000 Hz and 5000 Hz than low bass or very high treble frequencies. 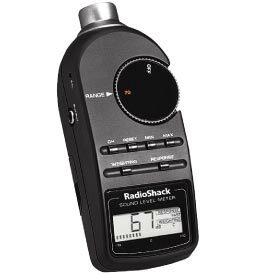 For that reason, most SPL meters are able to read the sound pressure level with different weightings. These weightings take into consideration the nonlinearity of the human ear’s sensitivity to certain frequencies. So, for an SPL meter to reliably “hear” the way our ears do, the SPL meter must use either an A, B, or C weighting. The proper weighting to use would depend on the relative volume of the sound to be measured. A-weighting would be used for very quite SPL’s, B-weighting for medium SPL’s, and C-weighting for louder SPL’s. Some meters may only have A or C weighting choices, which is adequate for most uses. Another problem encountered with judging a venue’s music loudness or volume using SPL measurements is the fact that unless the sound system is properly setup and calibrated, and being operated by a competent sound technician that can produce a well-balanced tonal mix of the program material (music, vocals, speech, etc. ), the SPL reading may be highly unrepresentative of the actual apparent volume to the audience. What do I mean? If your ideal SPL goal is 85 dB, but the tonal mix is severely biased toward the midrange frequencies, then your overall sound volume will be lower than ideal, but very uncomfortable to endure as an audience member. In this case, if the mix was repaired to have a proper tonal balance, we could bring the overall volume of the mix up in level to the audience without increasing the SPL reading on the meter! Also, the typical audience member might even think the overall volume was decreased due to the sound being more comfortable! So, unless the sound system and the sound technician can create a mix with the proper tonal balance, then SPL measurements are highly inaccurate of providing any valuable information. So, what is the ideal SPL reading for my sound system? Well, that’s a tough question that depends on several variables. The first variable is whether your sound system has been properly setup and calibrated, and whether the sound technician is mixing the sound properly. The sound system must be properly setup and calibrated and operated properly. If not, then get it done! Consult professional help and training, if needed (contact me!). If the system is setup properly and being operated and mixed properly, then the next variable would be the acoustics of the environment. Rooms with poor acoustics, such as reverberant or highly reflective spaces, will not support higher SPL’s very efficiently or effectively. Those spaces may give the listener an exaggerated feeling that the SPL is higher than it actually is. The next variable would be the environmental noise in the space. Noise could be from the building, the HVAC system, the audience, the outside, or the sound system, itself. Sufficient SPL will be needed to overcome any of these noises. In some cases, if these noises are too great, the SPL needed will be impractically too large, so the proper remedy would be to lower the SPL of these noises FIRST. Unless the variables are contained, there will not be an ideal SPL. So, now that all the variables are take care of, what SPL would be considered ideal for your venue? You may have to determine that for yourself. And, how are you going to measure the SPL in the venue? A normal Sunday service?…by playing a pre-recorded CD?…a tone or pink noise source? If you determine an ideal SPL using a pre-recorded CD as your music source, then that would not yield an ideal target for a typical Sunday service. A live band is generally going to be more dynamic than the music on a CD, and as such, when you get the band up to your target SPL set by using a CD, the band may be too loud. Not trying to discourage, but be cautious in your testing and target SPL setting, knowing that adjustments and corrections will need to be made to compensate for different sources, such as your live band, pre-recorded tracks, spoken word, etc. I will say that in a properly designed room with a properly adequate and calibrated sound system operated by a properly trained sound technician, 85 dB SPL measured 66% back in the seating area using a pre-recorded CD is a great starting point. Depending on your church’s style of music and overall preferences in worship, this target reading could be set lower or higher. For a live band, the overall SPL may be lower, such as around 80 dB, but could peak upwards to 95 dB, or more, with certain instruments, such as a kick drum, for example, on certain songs during certain moments. Remember that a live band should sound dynamic and engaging. That’s the beauty of them. Ultimately, above all else, the actual SPL you decide needs to be loud enough to adequately overcome background noise with great, pleasing sound, but not too loud as to be uncomfortable to most audience members. So, don’t be tied down to an SPL meter. Hopefully, you now realize that what they read may not give an accurate picture of what’s going on during an actual service. It’s been said many times that you can’t please all the people all the time. This is especially true with church members. When the ideal volume of the sound system is being discussed, please be advised that you can’t satisfy everyone. I personally believe that if the SPL is at the ideal level for your venue, you could still have a complaint or two that the volume of the sound system is too loud. This may, or may not, be true. Sometimes, volume is not the real issue as much as tonal balance or mix decisions. In those cases, sound system setup or calibration may be needed, or possibly personnel training. But, even if volume is the issue, I strongly suggest that the church have a policy in place that sets a targeted goal toward “customer satisfaction” that is handled by the worship pastor, minister of music, or appropriate church staff member, not the sound technician(s). A very popular, highly respected church we all probably know and love (I won’t name them without their permission) has a 97% goal in satisfying the congregation with regards to sound. They know they can’t please everyone, and trying to do so is impossible. For that reason, the staff has settled on having to receive more than 3% of the attendance in complaints before anything is done. Why 97%? Not sure. They had to pick something realistic, and that works for them. If your sound technician is expected to compensate for every complaint he or she receives, they, and you, are fighting a losing battle. Pastors and worship leaders, respect your team and protect them from chasing that rabbit. Just my thoughts. In other words, our ears are much more sensitive to midrange frequencies between 2000 Hz and 5000 Hz than low bass or very high treble frequencies. That’s obviously a typo, the 2000Hz and 5000Hz. Missing the K in there perhaps? Hi Craig! 2000 Hz (or 5000 Hz) is correct. 2000 KHz would be out of the range of human hearing. That’s 2 MHz! You might be thinking about 2 KHz to 5KHz, which is the same as 2000 to 5000 Hz.